SFA Horticulture Club hosts landscape architect and author of “Planting in a Post-Wild World”, Thomas Rainer. 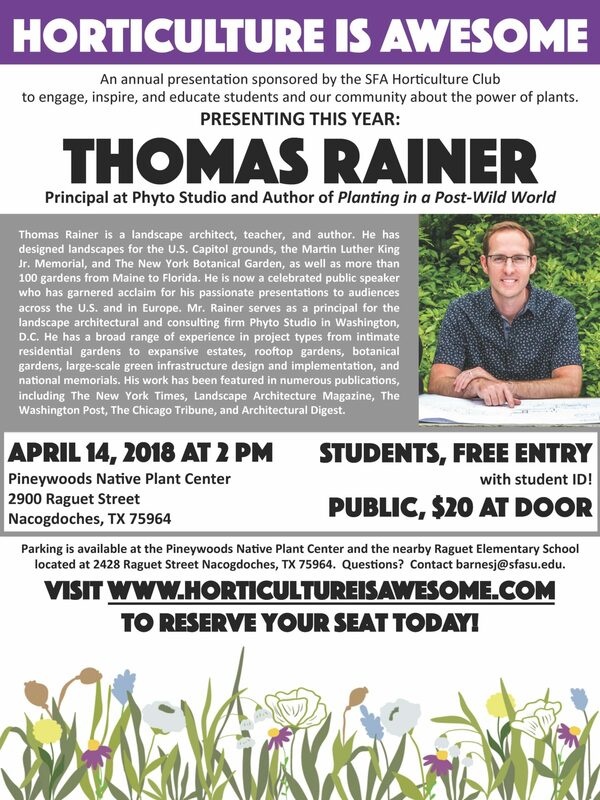 Nacogdoches, Texas – The SFA Horticulture Club will host a presentation by Thomas Rainer, principal at Phyto Studio, on Saturday, April 14at 2 p.m. in the Ina Brundrett Conservation Education Building at the Pineywoods Native Plant Center, located at 2900 Raguet St.
Rainer is a landscape architect, teacher, and author who has designed landscapes for the U.S. capitol, Martin Luther King Jr. Memorial, and New York Botanical Garden, as well as 100 more gardens along the East Coast. Rainer serves as a principal for the landscape architecture and consulting firm Phyto Studio in Washington D.C. Widely acclaimed across the United States and Europe as a public speaker, Rainer’s experience also ranges in projects from residential gardens to expansive estates, rooftop gardens, botanical gardens, largescale green infrastructure design and implementation, and national memorials. His works as a designer have been featured in The New York Times, Landscape Architecture Magazine, The Washington Post, The Chicago Tribune, and Architectural Digest. The lecture entry fee is $20, and is free to students with student ID. Parking is available at the Pineywoods Native Plant Center and the nearby Raguet Elementary School, located at 2428 Raguet St.
Visit horticultureisawesome.com to reserve your seat today!